With the 2019 NFL Draft just around the corner, the Oakland Raiders have been busy working out some of the top prospects that they can potentially use their three first-round picks on. The Raiders have the fourth, 24th and 27th overall picks when accounting for their own, the Chicago Bears’ due to the Khalil Mack trade and the Dallas Cowboys’ due to the Amari Cooper trade. One blatant area of need for the Raiders is pass rushing after ranking dead last in the NFL in sacks in 2018. One of the top pass rushers in the draft is former Kentucky linebacker Josh Allen. 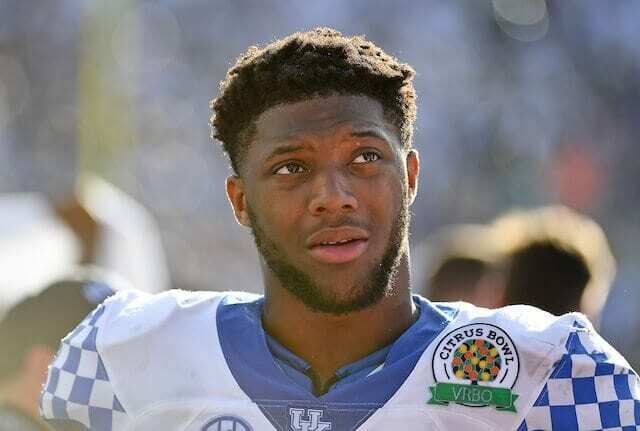 Kentucky’s Josh Allen has a private visit today and Tuesday with the Oakland Raiders. Houston’s Ed Oliver has a private visit today and Tuesday with the NY Jets. In four seasons at Kentucky, Allen had 220 total tackles, 31.5 sacks and 11 forced fumbles. He had an outstanding senior season, recording 88 tackles, 17 sacks and five forced fumbles, which were all career-highs. The #Raiders are hosting #Iowa TE Noah Fant today, source said. They pick No. 4 and No. 24 (and No. 27). Fant is projected to be a late first-round pick so he could be someone the Raiders look at with the 24th and 27th picks. With Jared Cook leaving in free agency, tight end is a position of need for Oakland and Fant is the best tight end in the draft. In three seasons at Iowa, Fant caught 78 passes for 1,083 yards and 19 touchdowns. He had 39 receptions for 519 yards and seven touchdowns in 2018. Linebacker is another position of need for the Raiders, and White is another projected top-10 pick that would fill that role. White had 286 total tackles and 8.5 sacks in three seasons at LSU, including 123 tackles and three sacks in 2018. He would join a linebacking corps that has already added Vontaze Burfict and Brandon Marshall to the mix this offseason.